Dental amalgam is the most commonly used dental restorative material used for dental fillings. First introduced in France in the early 19th century, it contains a mixture of mercury with at least one other metal. Amalgam has been the restorative method of choice for many years due to its low cost, ease of application, strength, durability, and bacteriostatic effects. The main advantage of dental composite over traditional materials such as amalgam is improved aesthetics. Composites can be made in a wide range of tooth colours allowing near invisible restoration of teeth. Composites are glued into teeth and this strengthens the tooth's structure. Composite resin restorations have several disadvantages: They are technique-sensitive meaning that without meticulous placement they may fail prematurely. They take up to 50% longer to place than amalgam fillings and are thus more expensive. In addition clinical survival of composite restorations placed in posterior teeth has been shown to be significantly lower than amalgam restorations. The objective of scaling and root planning, is to remove or eliminate the agents which cause dental plaque, its products and calculus, thus helping to establish gums that are free of disease . Scaling should be carried out at least every six months. Smokers, diabetics and patient who suffer from gum disease should see the hygienist more regularly. Oral hygiene is important to keep your mouth healthy, to prevent gum disease and decay of the teeth. In addition, several recent clinical studies show a direct link between poor oral hygiene and serious systemic diseases, such as Cardiovascular Disease (Heart attack and Stroke) Low Birth Weight, Diabetes complications and Osteoporosis. This can be done under local anaesthetic to make it more comfortable. Root canal treatment is the removal of the nerve from the tooth. The nerve is the soft, inner core of the tooth that consists of blood vessels, and connective tissue. When the nerve is diseased or injured it can't repair itself and dies. Without treatment, pus builds up forming an abscess. This presents as a dull aching pain that keeps the patient awake at night. A denture is an appliance that is worn to replace natural teeth. Dentures can be taken in and out of the mouth. Dentures are usually made from lifelike resin teeth bonded to a plastic base. A complete denture replaces all your natural teeth. 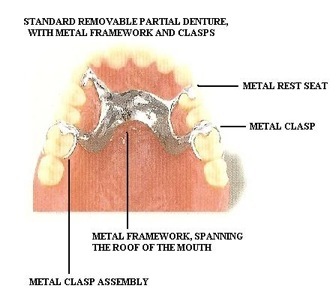 A partial denture is usually held in place by clasps or metal clips that fit around some of the remaining teeth. Dentures improve chewing ability and speech, and provide support for facial muscles. :ike natural teeth, dentures need cleaning morning and night. The main purpose of cleaning is to remove the dental plaque which builds up on dentures and any remaining teeth, which can harm gums. Metal dentures are one of the most common types of partial dentures, and very successful. They are constructed of a metal framework, with the necessary areas covered with denture teeth and gum colour acrylic. There will usually be 2 or more metal clasps that hook onto the teeth to aid in retention. These can be tightened or loosened depending on patient preference. A few teeth may need to have rests prepared, which allow the framework to seat on the teeth and distribute forces properly. Rest preps are done without aesthetic, and are like little dimples. Plastic dentures are made entirely of acrylic. They are not as strong as the metal dentures so do break more easily. Like the metal framework partials, they can also have retaining clasps that hook onto the teeth. They are less expensive. Acrylic dentures cover more of the mouth surface than metal denture which can affect taste and speech more. We offer the facility to have dental treatment carried out under general anaesthetic. This is under the care of anaesthesias in a hospital setting. A consultation appointment must be made with Larry to access suitability first. Dental Crowns are a type of dental restoration which, when cemented into place, entirely covers or "caps" over the portion of a tooth that lies at and above the gum line. Since dental crowns encase the entire visible aspect of a tooth, a dental crown in effect becomes the tooth's new outer surface. Crowns can be made out of porcelain, metal (a gold or other metal alloy), or a combination of both. Dental crowns are routinely made for teeth that have broken, worn excessively, root treated, or else have had large portions destroyed by tooth decay. Bridges are commonly used to replace one or more missing teeth. Gaps left by missing teeth eventually cause the remaining teeth to rotate or shift into the empty spaces, resulting in a bad bite. Missing teeth can cause a change in bite, shifting of the teeth, temporomandibular joint disorder (TMJ), speech impediments, an increased risk for periodontal disease and a greater chance of tooth decay. Bridges span the space where the teeth are missing. Bridges are cemented to the natural teeth or implants surrounding the empty space. These teeth, called abutments, serve as anchors for the bridge. 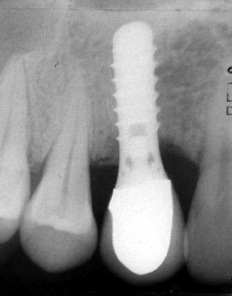 A replacement tooth, called a pontic, is attached to the crowns that cover the abutments. As with crowns, you have a choice of materials for bridges. Your dentist can help you decide which to use, based on the location of the missing tooth (or teeth), its function, aesthetic considerations and cost. Porcelain or ceramic bridges can be matched to the colour of your natural teeth. In areas of your mouth that are under less stress, such as your front teeth, a cantilever bridge may be used. Cantilever bridges are used when there are teeth on only one side of the open space. a dental implant is a metal fixture (usually a screw) that is placed into the jaw bone. It acts as a support for a false tooth or a set of false teeth. The fixture fuses with the jaw bone Implants are made of Titanium. This is the same metal that has been successfully used in hip replacements for many years. Total Cost Implant €3000 (€1500 placement & €15000 restoration ) like natural teeth, dentures need cleaning morning and night. The main purpose of cleaning is to remove the dental plaque which builds up on dentures and any remaining teeth, which can harm gums. Veneer is a thin layer of restorative material placed over a tooth surface, either to improve the aesthetics of a tooth, or to protect a damaged tooth surface. There are two main types of material used to fabricate a veneer, composite and dental porcelain. A composite veneer may be directly placed (built-up in the mouth), or indirectly fabricated by in a dental laboratory, and later bonded to the tooth. At Home Whitening System: This is where the Dentist takes impressions of your teeth, and the customized trays are made. You apply gel to the trays and wear them for an hour or two a day for two weeks . In Office Whitening Treatment: This is where you have three concurrent 20 minute gel and light applications for instant whitening results. The gel used in surgery is a stronger percentage and gives a quicker result than the home kit. I strongly recommend for best results the use of both at home and in surgery technique. The home kit can be used to top up the process after treatment. Gel can be bought in the practice. At the moment the only treatment covered by the PRSI is an annual exam unfortunately.